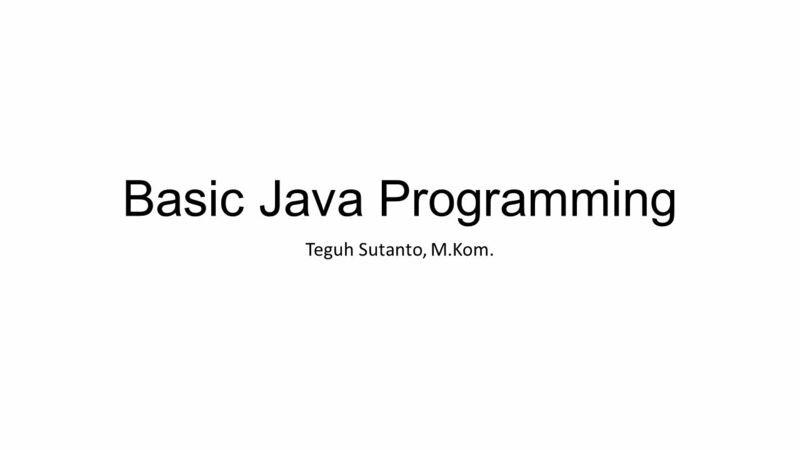 1 Basic Java Programming Teguh Sutanto, M.Kom. 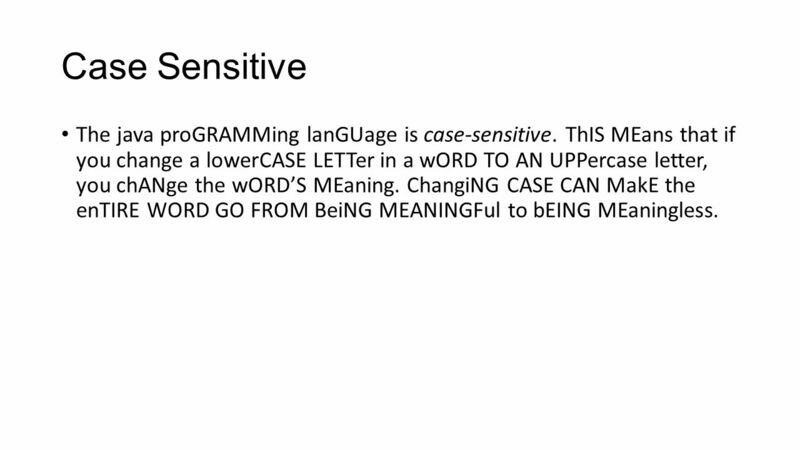 15 Case Sensitive The java proGRAMMing lanGUage is case-sensitive. 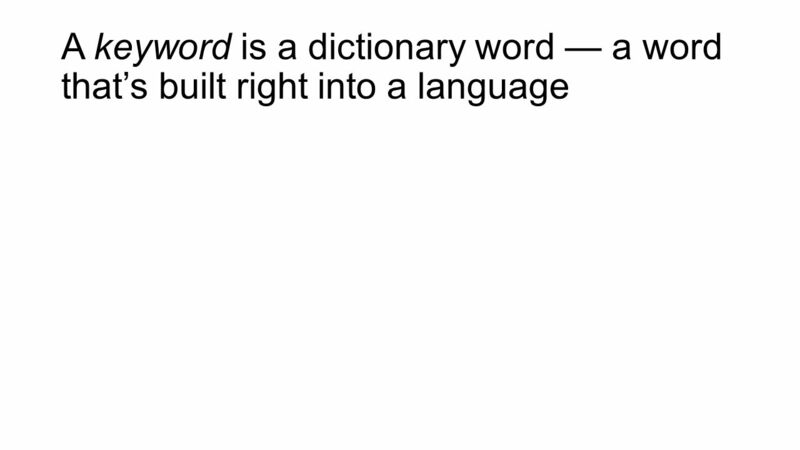 ThIS MEans that if you change a lowerCASE LETTer in a wORD TO AN UPPercase letter, you chANge the wORD’S MEaning. ChangiNG CASE CAN MakE the enTIRE WORD GO FROM BeiNG MEANINGFul to bEING MEaningless. 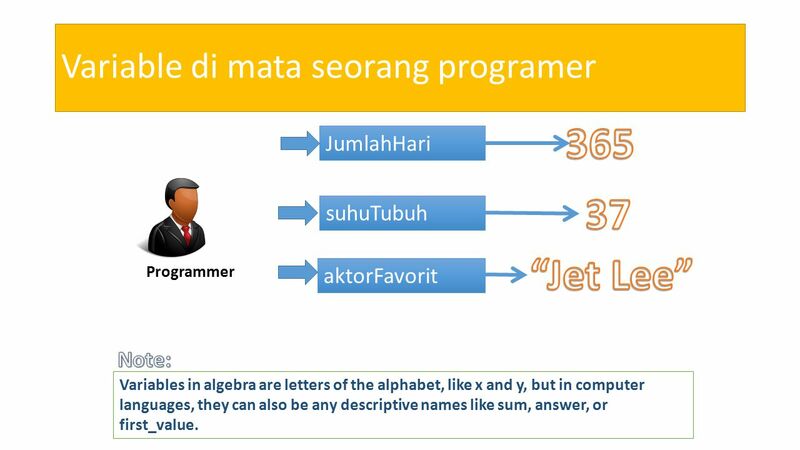 18 Variable di mata seorang programer JumlahHari suhuTubuh aktorFavorit Programmer Variables in algebra are letters of the alphabet, like x and y, but in computer languages, they can also be any descriptive names like sum, answer, or first_value. 20 So…what is the var? Computer programs manipulate (or process) data. 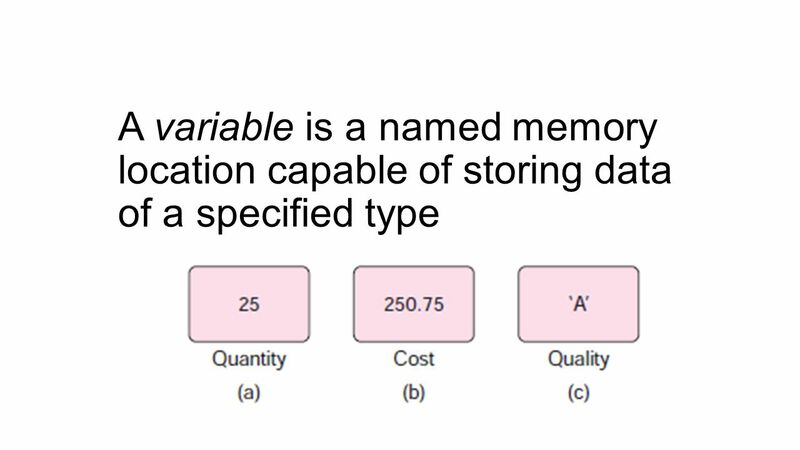 A variable is used to store a piece of data for processing. 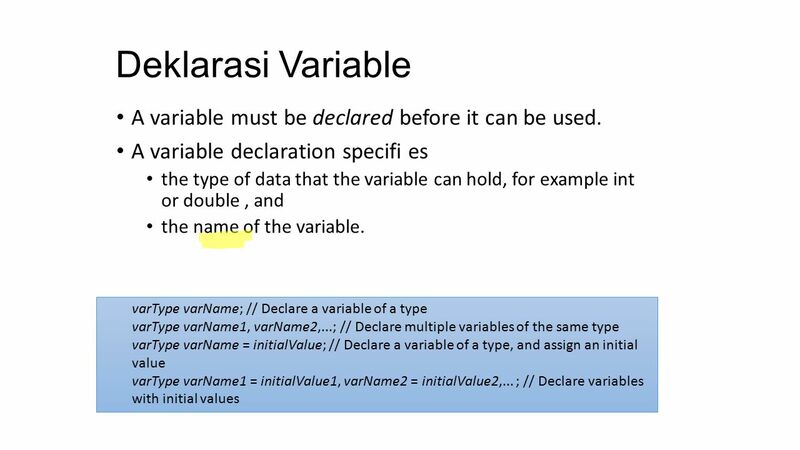 It is called variable because you can change the value stored. 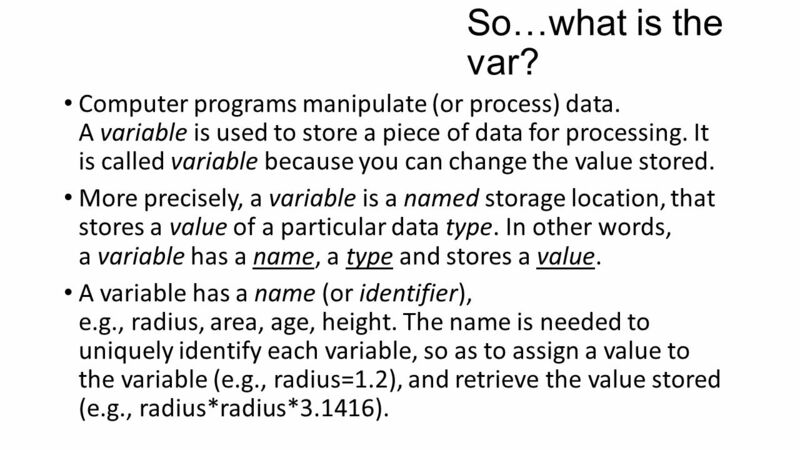 More precisely, a variable is a named storage location, that stores a value of a particular data type. 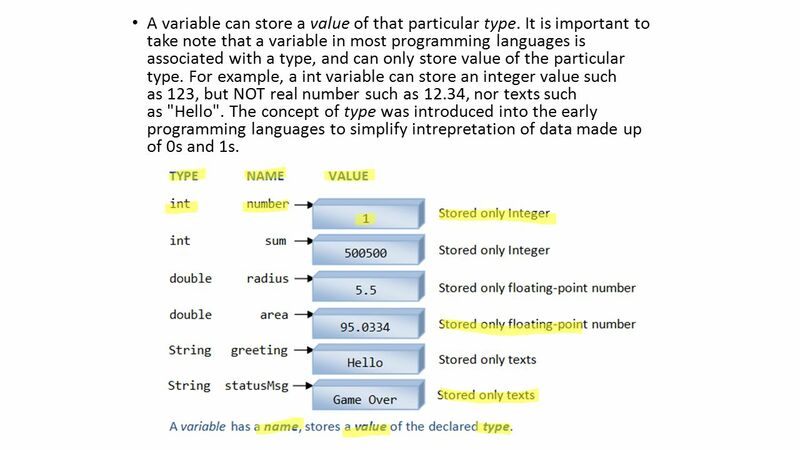 In other words, a variable has a name, a type and stores a value. A variable has a name (or identifier), e.g., radius, area, age, height. The name is needed to uniquely identify each variable, so as to assign a value to the variable (e.g., radius=1.2), and retrieve the value stored (e.g., radius*radius*3.1416). 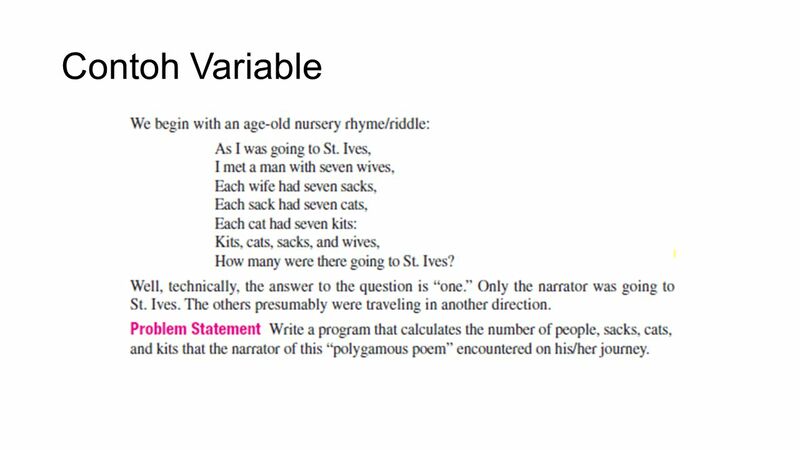 21 Variable…(cont) A variable has a type. 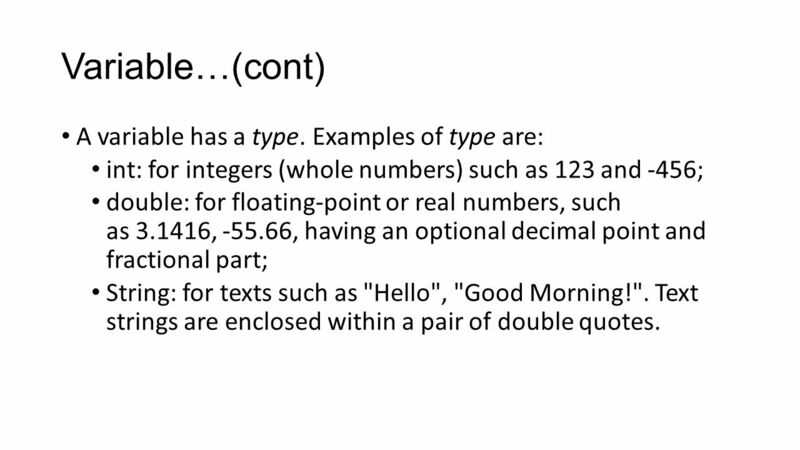 Examples of type are: int: for integers (whole numbers) such as 123 and -456; double: for floating-point or real numbers, such as 3.1416, -55.66, having an optional decimal point and fractional part; String: for texts such as "Hello", "Good Morning!". 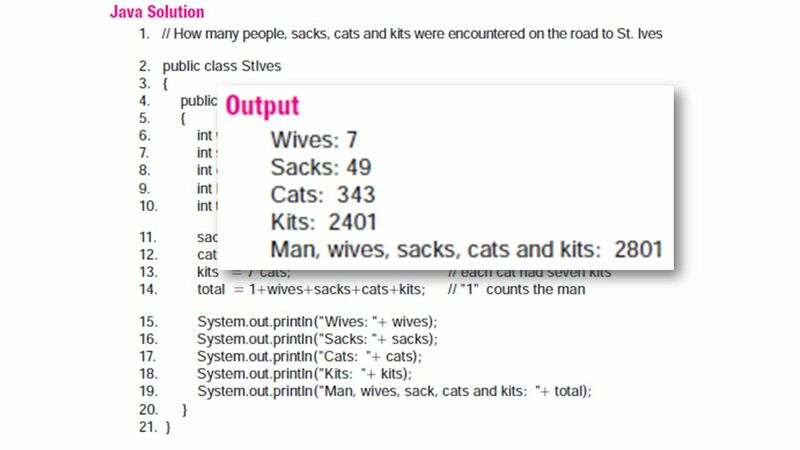 Text strings are enclosed within a pair of double quotes. 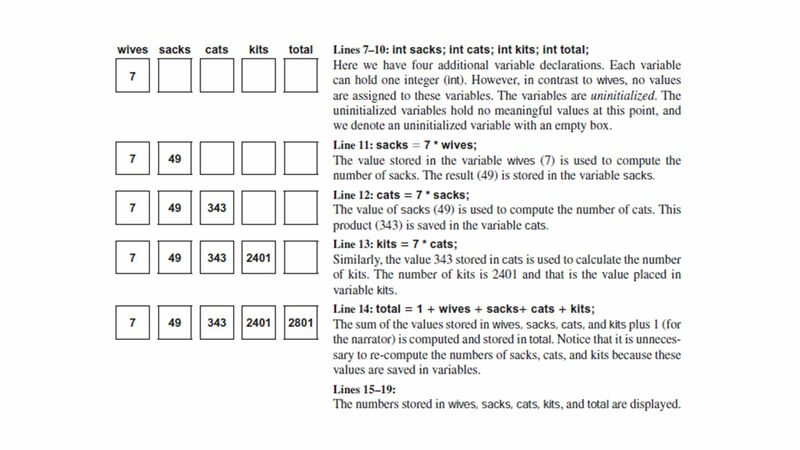 24 A variable can store a value of that particular type. 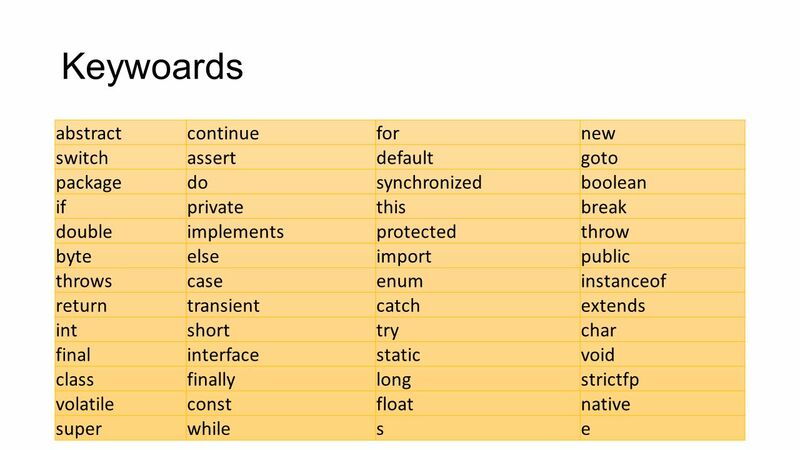 It is important to take note that a variable in most programming languages is associated with a type, and can only store value of the particular type. For example, a int variable can store an integer value such as 123, but NOT real number such as 12.34, nor texts such as "Hello". The concept of type was introduced into the early programming languages to simplify intrepretation of data made up of 0s and 1s. 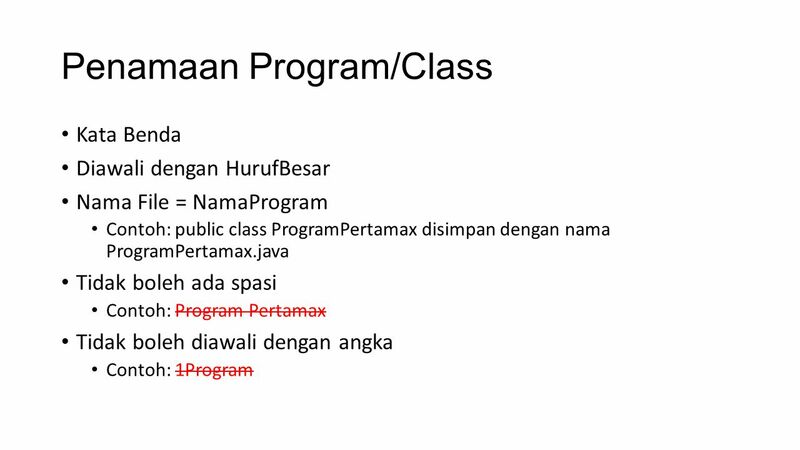 Download ppt "Basic Java Programming Teguh Sutanto, M.Kom.. Tujuan Mahasiswa dapat menyebutkan berbagai tipe data dan operato." IT 325 OPERATING SYSTEM C programming language. 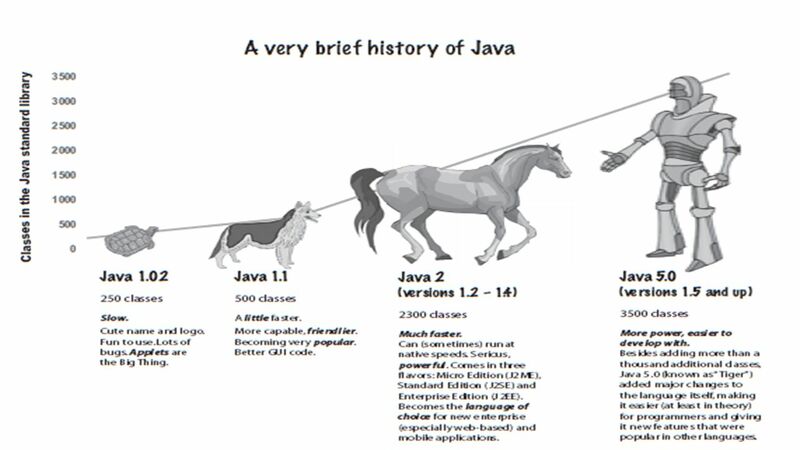 Why use C instead of Java Intermediate-level language:  Low-level features like bit operations  High-level. 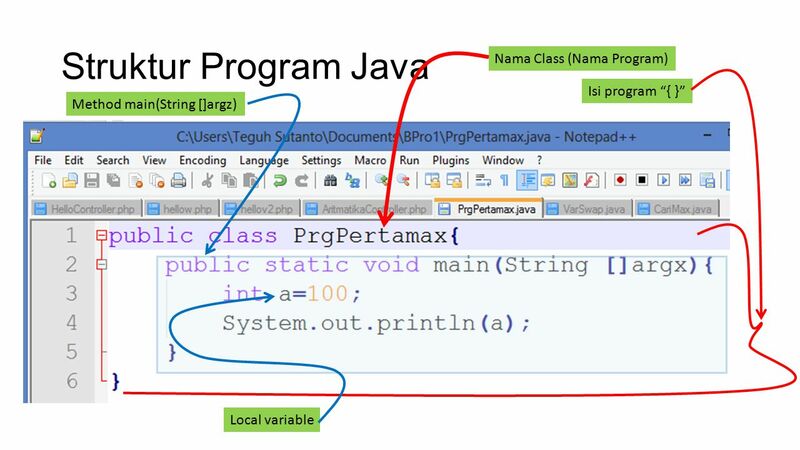 JAVA Variables Declaring Variables Over writing Variables Data types Displaying contents of a Variable Naming a Variable Strings. 08/2012Tanya Mishra1 EASYC for VEX Cortex Llano Estacado RoboRaiders FRC Team 1817. 1 pritisajja.info Unlocking the World of Java Programming….. Priti Srinivas Sajja February, 2014 Visit pritisajja.info for detail Future Technology for. 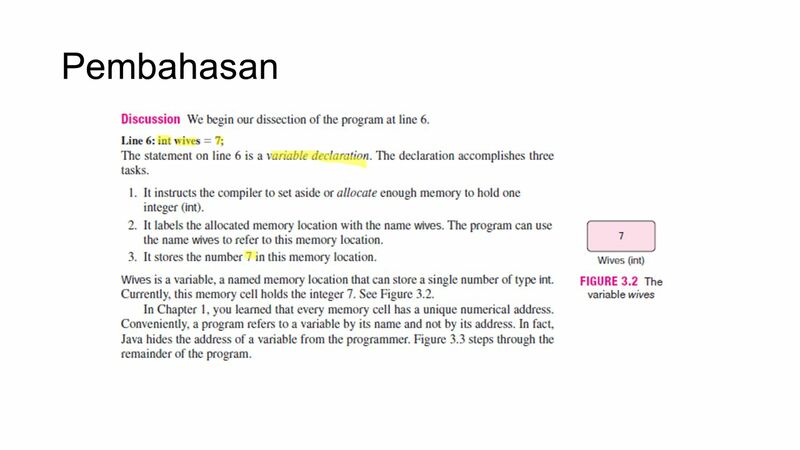 CS0007: Introduction to Computer Programming Console Output, Variables, Literals, and Introduction to Type. 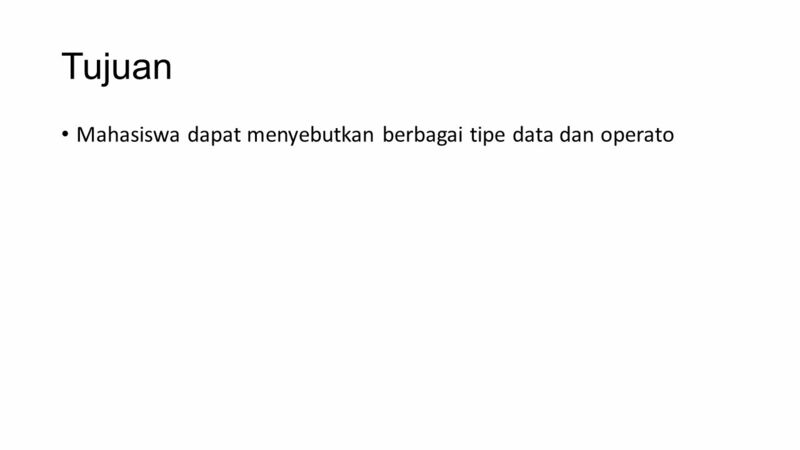 Variabel, Tipe Data & Operator Teguh Sutanto, M.Kom.  2005 Pearson Education, Inc. All rights reserved Introduction. 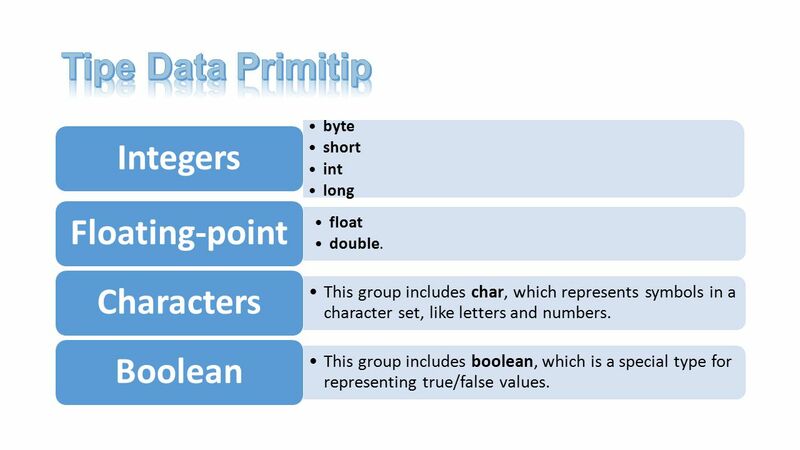 Primitive Data Types There are a number of common objects we encounter and are treated specially by almost any programming language These are called basic. 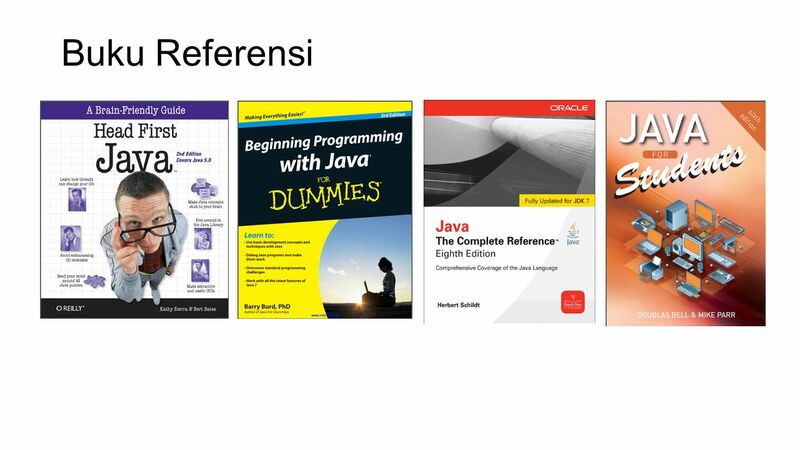 1 Java Basics. 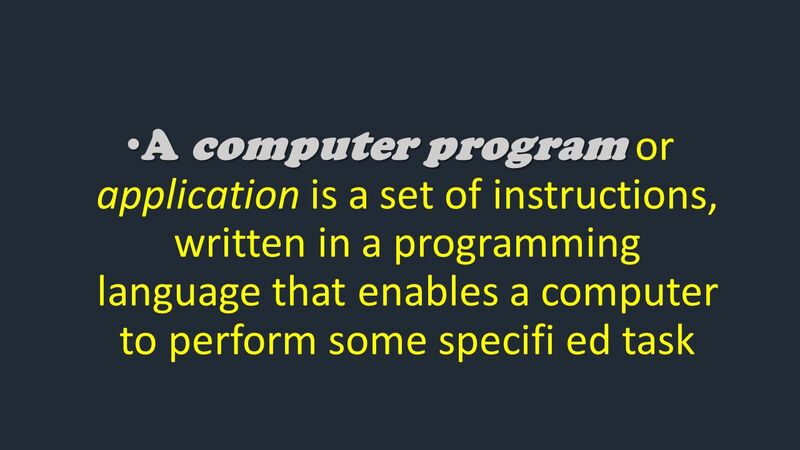 2 Compiling A “compiler” is a program that translates from one language to another Typically from easy-to-read to fast-to-run e.g. from. ECE122 L2: Program Development February 1, 2007 ECE 122 Engineering Problem Solving with Java Lecture 2 Program Development. 1 Key Concepts:  Why C? 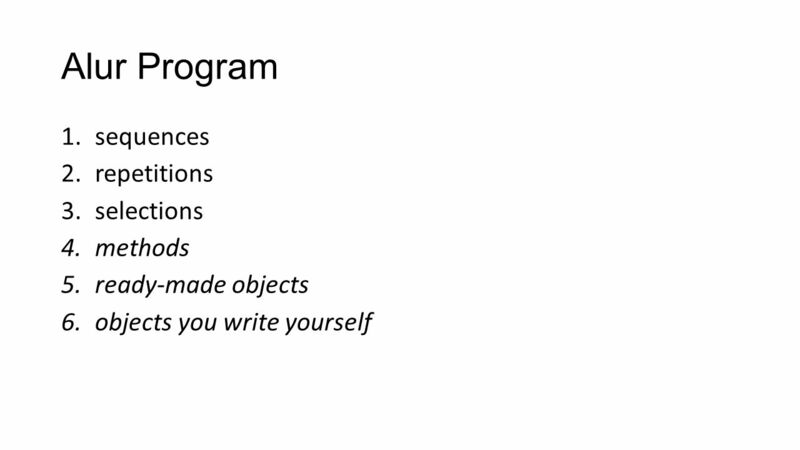  Life Cycle Of a C program,  What is a computer program?  A program statement? 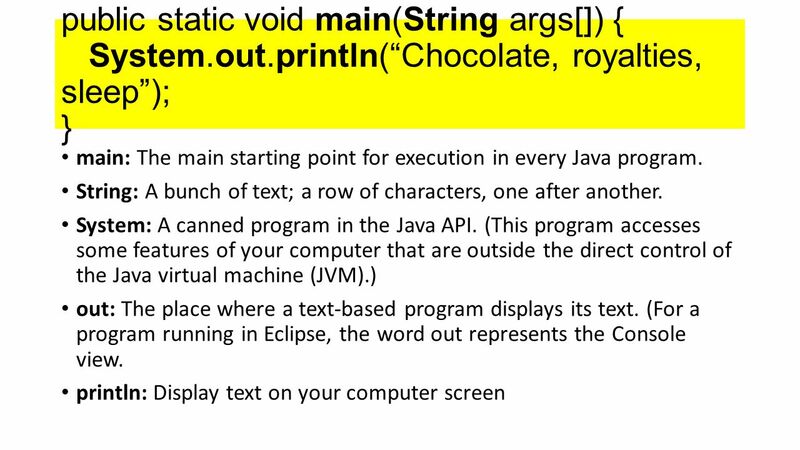  Basic parts of a C program,  Printf() function? 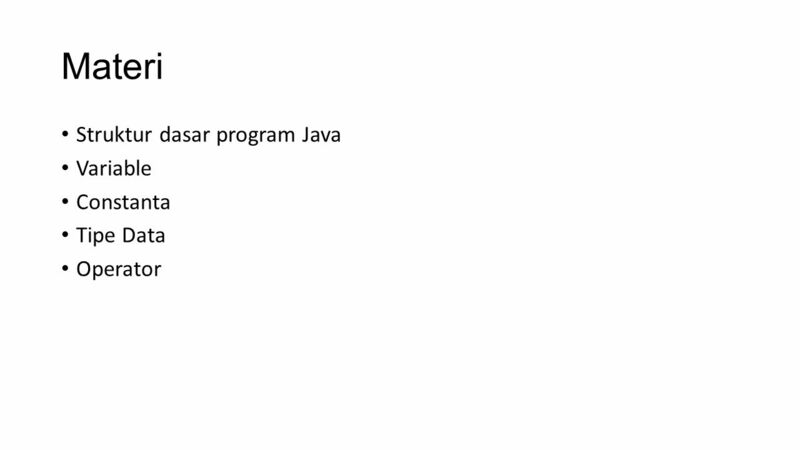 1 Data types, operations, and expressions Overview l Format of a Java Application l Primitive Data Types l Variable Declaration l Arithmetic Operations. 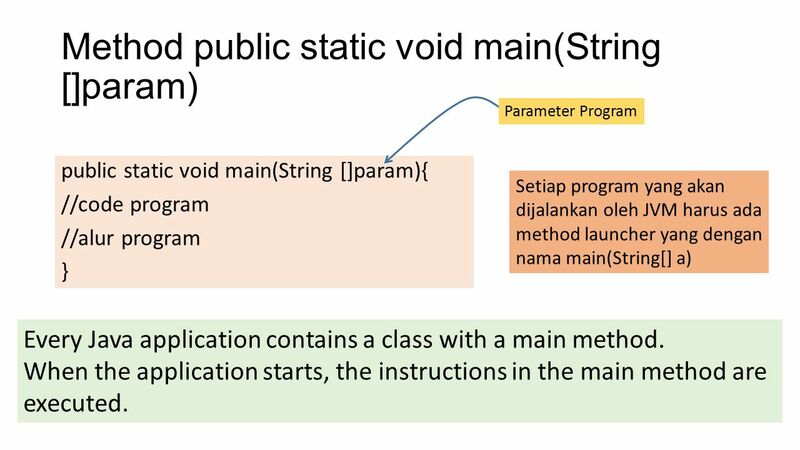 Computer Science: A Structured Programming Approach Using C1 Objectives ❏ To understand the structure of a C-language program. ❏ To write your first C.
Hello, world! 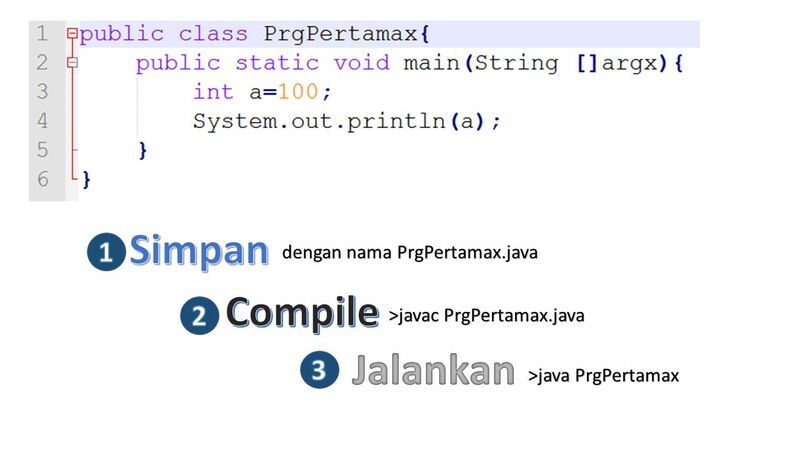 Dissect HelloWorld.java Compile it Run it.